Despite the increasing international availability of Korean food and drink, there is one traditional product best sampled when visiting South Korea – makgeolli. With significant amounts of lactobacilli, or lactic acid bacteria, the milky opaque liquor is probiotic, which means it’s good for digestion and bolstering the immune system. But the same fermentation process that makes makgeolli rich in amino acids and vitamins also means the traditional drink doesn’t travel well without pasteurisation. It’s at its best when consumed fresh, a week or two after being brewed. Freshly brewed makgeolli has a distinctive flavour that has alternatively been described as sweet and tart, creamy, bitter and astringent. Although bottled makgeolli is sold worldwide, exported versions have to be sterilised to stop the fermentation process, then treated with preservatives and sweeteners such as aspartame to mask the taste. That’s why anyone enthusiastic about Korean cuisine, interesting liquors, probiotics or educating their palate should travel to South Korea if they want to try authentic, freshly brewed makgeolli. Koreans have been brewing makgeolli since the Shilla Dynasty (57 BC to 935 AD), and it always begins with nuruk, a fermentation starter that is similar to malt and yeast. Each brewery uses its own nuruk, mixing in steamed rice, yeast and water, then sometimes herbs and flowers. For centuries makgeolli was brewed at home but it fell out of favour in the 1970s when South Koreans began to prefer imported wine and other liquors. Recently, the vitamin-rich brew has enjoyed a revival, partly because of the health benefits, partly because of the low alcohol content and partly due to a renewed appreciation of South Korea’s culinary cultural traditions. For many brewers, making high end makgeolli involves using more traditional methods and avoiding the addition of artificial ingredients. To sample fresh brews, you can take a tour of brewing facilities or plan a visit around a makgeolli festival. Baesangmyeon Brewery’s makgeolli bar, Neurin Maeul, serves the traditional drink in a modern interior with high ceilings, exposed cement walls and tall stainless steel brewing pots that are installed in the middle of the bar. The bar’s award-winning makgeolli is made from rice, water and yeast in small batches to preserve the taste and smell. Based on its maturity, the makgeolli is categorised by seasons. “From spring to winter, the liquor becomes stronger and less fizzy,” said Kim Ki-Moon, manager of Neurin Maeul in Myeondong. After you’ve sampled makgeolli in its purest and simplest form, try it mixed into a cocktail combined with fruits, such as mango and pineapple, and ice. With its wooden walls and the warm orange light from colourful paper mache lanterns, this bar looks and feels more like a traditional makgeolli bar. Jeonju Traditional Makgeolli not only celebrates the liquor but the cuisine of Jeonju, a city famous for its savoury food. 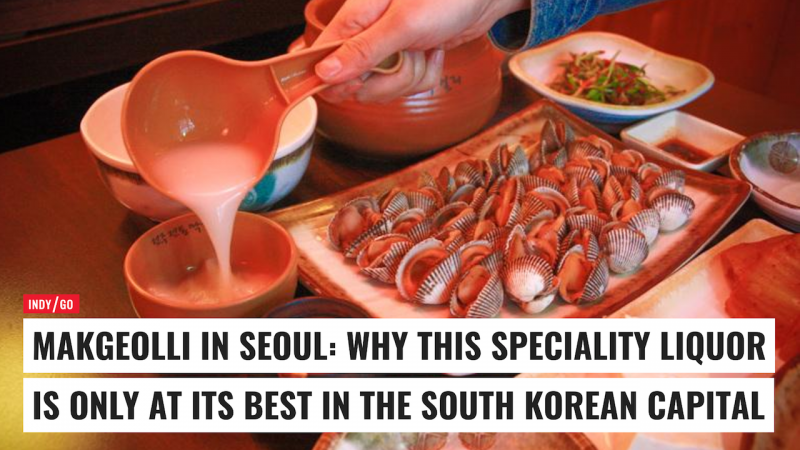 Order makgeolli and you can sample palate-pleasing snacks such as cockles and skate sashimi, as well as pancakes and oysters. Since it’s made with sweet rice nuruk and cultivated twice, Kim says the Moo Young makgeolli is the closest you can get to the traditional method of making makgeolli. The Sool Company (facebook.com/mmpkorea) offers tours that take visitors to breweries, with guides who speak English. Location: Gyeonggi-do, Jarasum Island, which is located in Gyeonggi Province, about an hour northeast of Seoul. Location: Gyeonggi-do, Ilsan, about an hour outside Seoul. For more information about festivals, visit the Korean Tourism Organisation (english.visitkorea.or.kr). This article by Angela Son and Joan Vos MacDonald was originally published in The Independent.